This day there went forth a branch from the root of Jesse: this day was Mary conceived without any stain of sin: this day was the head of the old serpent crushed by her. Alleluia. O God, who by the Immaculate Conception of the Virgin didst prepare a worthy dwelling-place for thy divine Son; grant, we beseech thee, that, as by the foreseen merits of the death of this thy Son, thou didst preserve her from every stain of sin, we also may, through her intercession, be cleansed from our sins and united with thee. Through the same Christ our Lord. Amen. The necessity for the Ark of the Covenant to be free from any stain. So great are the advantages we reap from the incarnation of the Son of God, and so incomprehensible is the goodness which he hath displayed in this wonderful mystery, that to contemplate it, and to thank and praise him for the same, ought to be the primary object of all our devotions, and the employment of our whole lives. In the feast of the Conception of the immaculate Virgin Mother of God we celebrate the joyful dawning of that bright day of mercy, the first appearance which that most glorious of all pure creatures made in the world, with those first seeds of grace which produced the most admirable fruit in her soul. Her conception was itself a glorious mystery, a great grace, and the first effect of her predomination. Her Divine Son, the eternal God, in the first moment of her being, considered the sublime dignity to which he had decreed to raise her, and remembered that august, dear, sacred, and venerable name of his mother, which she was one day to bear; and he beheld her with a complacency, and distinguished her in a manner, suitable to so near a relation she was to bear. He called her not his servant in whom he gloried, as he did Israel (Isaias, xlix. 3), but his mother, whom for the sake of his own glory he decreed exceedingly to exalt in grace and glory. From that instant the eternal Word of God, which was to take flesh of her, looked upon it as particularly incumbent on him, in the view of his future incarnation, to sanctify this virgin, to enrich her with his choicest gifts, and to heap upon her the most singular favours with a profusion worthy his omnipotence. She could say with much greater reason than Isaias: “The Lord hath called me from the womb: from the bowels of my mother he hath been mindful of my name.” (Isaias, xlix. 1) From that very moment he prepared her to be his most holy tabernacle. When Almighty God commanded a temple to be built to his honour in Jerusalem, what preparations did he not ordain! What purity did he not require in the things that belonged to that work, even in the persons and materials that were employed in it! David, though a great saint, was excepted against by God, because he had been stained with blood spilt in just wars. Again, what purifications, consecrations, rites, and ceremonies did he not order to sanctify all the parts of the building! This for a material temple, in which the ark was to be placed, and men were to offer their homages and sacrifices to his adorable Majesty. What then did he not do for Mary in spiritually decking her, whose chaste womb was to be his living tabernacle, from whose pure flesh he was to derive his own most holy body, and of whom he would himself be born! So tender a mercy was this great work to him, that the church, in her most earnest daily supplications, conjures him, as by a most endearing motive, that he will be pleased to hear her prayers, and enrich her children with his special graces, by his effusion and liberality towards her, when he most wonderfully prepared and fitted both her body and soul, that she might be made a worthy dwelling for himself. The first condition in the spiritual embellishing of a soul is perfect purity, or cleanness from whatever can be a blot or stain in her. A skilful statuary is careful, in the first place, that there be no irregularity or deformity in the piece which he is going to carve. And if a house is to be put in order and adorned, to receive some guest of great distinction, the first thing is to remove all filth, and whatever is offensive. Almighty God therefore was pleased to preserve this holy Virgin from contracting any stain of sin, whether original or actual. Without the privilege of an extraordinary grace, the greatest saints daily fall into venial sins of surprise and inadvertence, through a neglect of a universal watchfulness over all the secret motions of their hearts in the course of action. But Mary was distinguished by this rare privilege, and by the succour of an extraordinary grace was so strengthened, that her interior beauty was never sullied with the least spot, and charity or the divine love never suffered the least remission or abatement in her soul; but from the moment in which she attained the use of reason, increased, and she continually pressed forward with fresh ardour towards the attainment of higher perfection in virtue and holiness. Her exemption from original sin was yet a more extraordinary privilege of grace. It is an undoubted truth that she was sanctified and freed from original sin before she was born, and that she was brought into this world in a state of perfect sanctity. It is defined as an article of faith, that in her very conception she was immaculate. It is needless here to produce the passages of holy scripture usually alleged by theologians, and other proofs by which this doctrine is confirmed. It is founded in the clear testimonies of the most illustrious among the fathers, in the decrees of several particular councils, and the suffrages of most learned and eminent masters of the theological schools. The very respect which we owe to the Mother of God, and the honour which is due to her divine Son, incline us to believe this privilege most suitable to her state of spotless sanctity. To have been one moment infected with sin was not agreeable to the undefiled purity of her who was chosen to be ever holy, that she might be worthy to bring forth the Author of sanctity. Had she ever been in sin, notwithstanding the advantages of her other privileges and graces, and her predestination to the sublime dignity of Mother of God, she would have been for that moment before she was cleansed, the object of his indignation and just hatred. St. Austin thought this reason sufficient for exempting her, whenever mention is made of sin. “Out of reverence,” says he, “and for the honour which is due to her Son, I will have no question put about her when we speak of any sin.” Christ was no less her Redeemer, Reconciler, and most perfect Saviour and Benefactor, by preserving her from this stain, than he would have been by cleansing her from it: as by descending from Adam she was liable to this debt, and would have contracted the contagion, had she not been preserved from it through the grace and merits of her Son. The grace which exempted Mary from original sin, preserved her also from the sting of concupiscence, or inordinate love of creatures, and tendency to evil. The first sin of Adam brought on us a deluge of evils, and by the two wounds of ignorance and concupiscence which it has left in us, its malignity has spread its influence over all the powers of our souls. Through it our understanding is liable to be deceived, and to be led away with errors; our will is abandoned to the assaults of the basest passions: our senses are become inlets of dangerous suggestions: we are subjected to spiritual weakness, inconstancy, and vanity, and are tyrannized over by inordinate appetites. Hence proceeds in us a difficulty in doing good, a repugnance to our duties, a proneness to evil, the poisoned charm of vice, and the intestine war of the flesh against the spirit. All this we experience and groan under; yet under the weight of such miseries, by a much greater evil, we are blind, proud, and insensible. The excess of our misery is, that though it be extreme, we do not sufficiently deplore it, humble ourselves under it, and labour by watchfulness, mortification, and prayer to acquire strength against our dangers. Mary employed earnestly these arms during the course of her life, though free from this inward proneness to evil, and from the fomes peccati, or dangerous sting of concupiscence, which we inherit with original sin, and which remains after baptism, for the exercise of our virtue and fidelity. We court our dangers, indulge and fortify our enemies, and caress and adore those idols which we are bound to destroy. To procure for ourselves sons part in the blessing which Mary enjoyed, in the empire over our passions, we must check them, restrain our senses, and die to ourselves. We must never cease sighing to God, to implore his aid against this domestic enemy, and never enter into any truce with him. “Have mercy on me, O Lord, for I am weak; heal me, O Lord, for my bones are troubled.” (Ps, vii. 3) If our weakness and dangers call for our tears, we have still much greater reason to weep for our guilt and repeated transgressions. Whereas grace in Mary triumphed even over original sin; we, on the contrary even after baptism and penance, by which we were cleansed from sin, return to it again, increase our hereditary weakness and miseries; and, what is of all things most grievous, infinitely aggravate our guilt by daily offences. “Who will give water to my head, and a fountain of tears to my eyes?” (Jeremias, ix. 1) O, Mother of Mercy, let your happy privilege, your exemption from all sin and concupiscence, inspire you with pity for our miseries: and by your spotless purity and abundant graces, obtain for us strength against all our dangers, the deliverance from all our miseries, and the most powerful remedies of divine grace. Thus, from this mystery, we are to draw lessons of confusion and instruction for ourselves. Mary, in her conception, was not only free from stain, but moreover was adorned with the most precious graces, so as to appear beautiful and glorious in the eyes of God. And the grace she then received was the seed of the great virtues which she exercised, and the higher graces to which, by the improvement of her first stock, she was afterwards raised, during the whole course of her mortal life. By the first graces she was free from all inclination to accursed pride, and from all inordinate self-love, and remained always perfectly empty of herself. 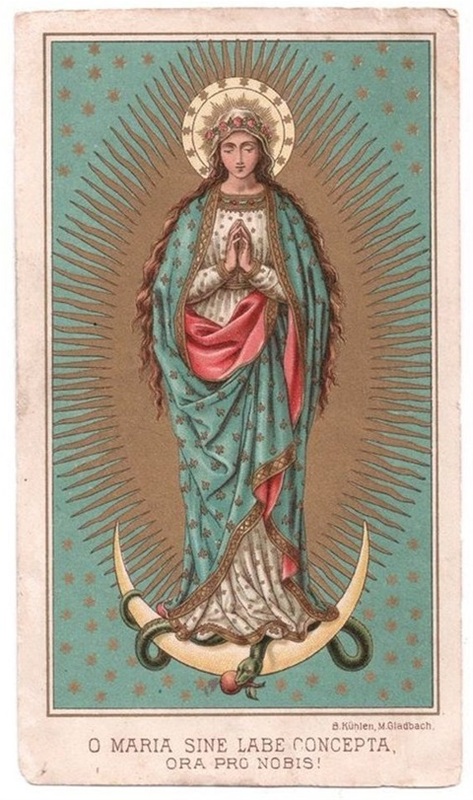 This disposition she expressed when honoured with the highest graces, and exalted to the most sublime and wonderful spiritual dignity; under which, sinking lower in her own abyss of weakness and nothingness, she sincerely and purely gave all glory to him. She confessed aloud that he chose her not for any merit, or any thing he saw in her, but because he would signalize his omnipotence by choosing the weakest and meanest instrument, and because he saw in her the nothingness in which he most fitly exerted and manifested his infinite power and greatness. By a lurking pride we obstruct the designs of the divine mercy in our favour. The vessel of our heart cannot receive the plentiful effusion of divine grace, so long as it is filled with the poison of self-love. The more perfectly it is cleansed and empty, the more is it fitted to receive. As the prophet called for vessels that were empty, that they might be filled with miraculous oil (IV or II Kings, iv); so must we present to God hearts that are perfectly empty, when we pray that he replenish them with his grace. The exercise of humility, meekness, patience, resignation, obedience, self-denial, rigorous self-examination, compunction, and penance begin the work: but prayer and divine love perfect the cleansing of the fountain from which they spring. Thus are we to attain that purity of heart and affections by which we shall bear some degree of resemblance to the holy Mother of God. This grace we ought earnestly to beg of God, through her intercession, and particularly to commend to him, through her, the preservation of the holy virtue of purity. Part I - Feast of the Immaculate Conception through the centuries. Part III - The Apostolic Constitution by Pope Pius IX, defining the dogma of Immaculate Conception, given at St. Peter's in Rome, 8th December, 1854. Draw us, O Immaculate Virgin! we will run after thee to the odour of thy ointments.